The e-book is not included in the premium membership benefits as it is provided by our affiliated company/division. Toy industry plays a fairly important role in the economic development of the Chinese mainland, Taiwan, Hong Kong, and Macau. As the overseas markets are becoming more aware of the product safety and environmental protection issues, the standards of toys safety are getting stricter. There are urgent needs for the toys safety standards in the above four areas, especially in the Chinese mainland and Hong Kong to get aligned with the developed countries. 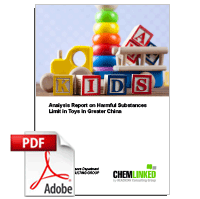 This report is going to introduce and compare the general requirements of harmful substances in toys and children’s products in aspects of the regulations and the standards. ►This affiliate publication is not included in ChemLinked paid membership. Please contact us through chemical@chemlinked.com to enjoy a 20% discount if you are our premium members. ►At ChemLinked we actively encourage external contribution, if you are interested in becoming one of our affiliate publishers please contact us.